Tap Your Feet and Find a Smile at This One! Sometimes you just have to have a little fun along with the work. We have a wonderful web site and partly thanks to Active Rain and all of our Google juice that remains at the top of the Search Engines. I was looking at the site the other day and I thought it just needed a little pick me up. So, with a little brainstorming and luck we came up with this little diddy to help make our customers and clients smile. I have to admit I laughed hard when I first listened to this as I found it to be refreshing and light. Just wanted to share it with you and maybe give you an idea or two for your own sites. I hope you find it fun too. And, by the way, if any of you have any ideas to add I think this is a great time of year to do so! If you are like us we slow down a bit around the holidays and that's the time we begin to step deeper into our marketing plans. We are open and willing to hear ALL IDEAS so pour it on! And, tap your foot a little. 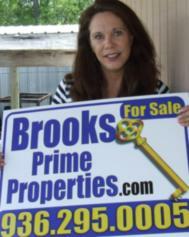 Lake Conroe Has Hot Properties at a Cool Price! Huntsville Community Theater, Interview with VP of Publicity! Lake Conroe Real Estate and Homes For Sale! My 500th Post in the Rain, ActiveRain Success Story!